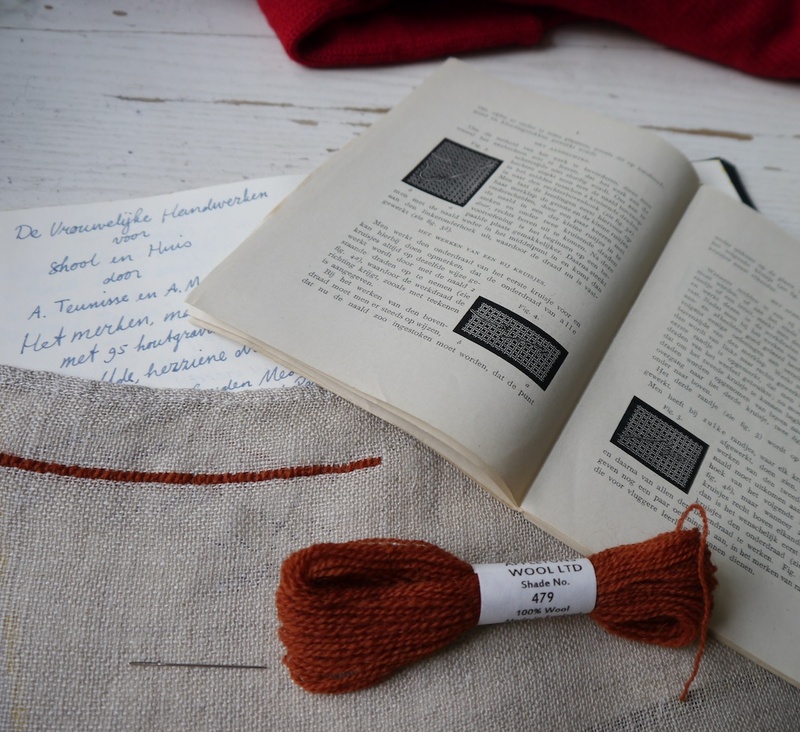 As part of my mending journey I wanted to go back to basics, and follow some old Dutch lesson plans about teaching young girls the ins and outs of marking household linen, and repairing of clothes and linens. The lesson plan I’m using the most, was originally written in 1888, although my edition is from 1916. Larger homes contained considerable quantities of household linen and undergarments, and in order to be able to return everything to its correct place after laundring, they were usually marked with initials and a number. 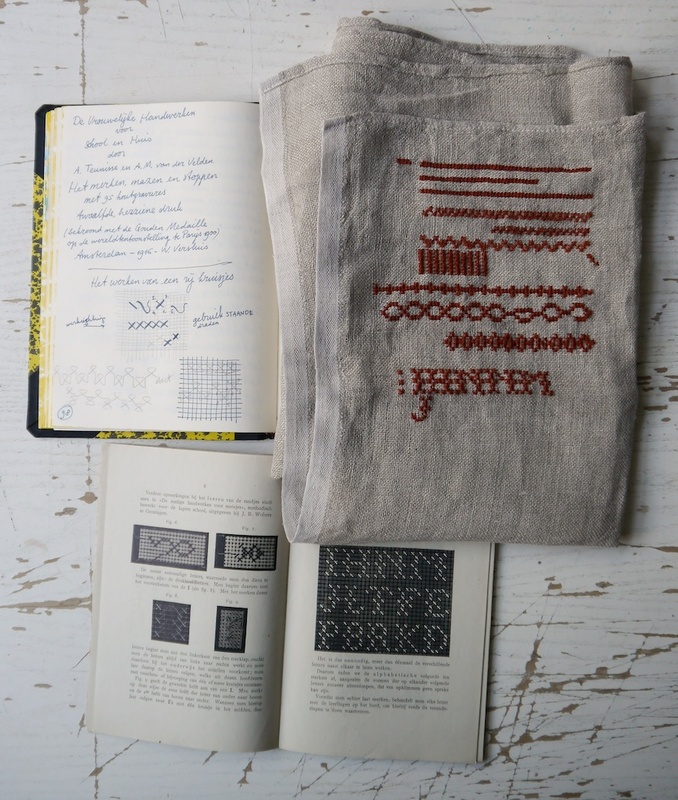 You can read more about it on the always interesting Textilis blog here, including some beautiful examples. Granted, I do not require my linens and undergarments to be marked for wash day, so I could’ve skipped the chapter on marking and go straight for the chapters on repair, but in order to gain a deeper understanding of the methods employed in this book, I decided to spend some time on marking as well. And it turns out that just reading through the chapter, and actually following the instructions are two rather different experiences. 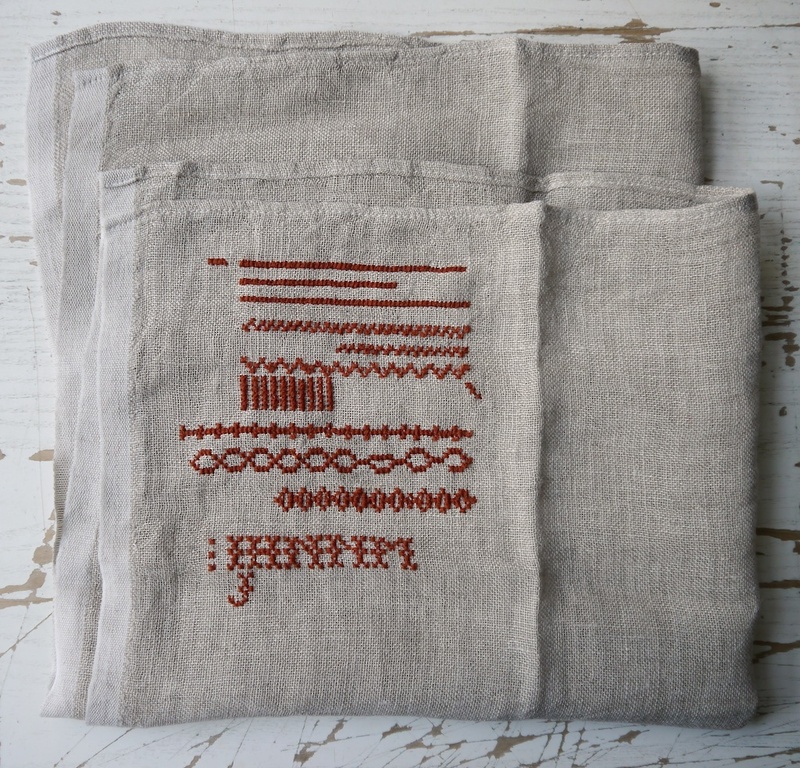 The chapter starts with stating that the marking of linen is such a well-known needlecraft, a chapter on its techniques can almost be considered superfluous to requirements. Nevertheless, an outline of how to approach teaching this in a classroom was considered of interest by the authors. And so it begins: what fabric to use (a loose-weave linen or canvas that is easily counted), what thread (start off with embroidery wool), how to attach the thread, how to finish it. I availed myself of some scrim (nowadays only really used for cleaning windows I think) and some crewel wool. The first steps are easy: a simple border in cross stitch, by making all the crosses in a straight line. This is worked from left to right. However, the next few borders are more complex, and here the advise is to work them from right to left. The lesson plan briefly discusses that sometimes it’s best to complete a cross before moving on to the next one, and at other times, you can work them in two journeys, first working one half of the crosses, then the other half on the way back. The emphasis is on keeping things neat and tidy at the back. This makes sense, as you don’t want to have long floats at the back which might get caught during the laundry process. I tried out various ways with the more complex borders, exploring in which cases it seemed to be better to complete a whole cross, and in which cases it seemed better, or easier, to do them in two journeys. Unsurprisingly, this is different for each border. The lesson plan refers to another book by the same author, which apparently goes into greater detail on cross stitch, but unfortunately, I don’t own that. After stitching those more complex borders from right to left, it was time to tackle the letters. The book advises you to slowly work your way up from the easiest letters, with mainly vertical elements (I, H, M, N) to the more complex letters (J, L, T, F, E, P, B, R, K, D) followed by those with strong diagonal elements (A, V, W, X, Y, Z) and the most complex ones of all, those with curves (U, C, G, O, Q, S). As the emphasis is on building up the complexity, they writers strongly advise against simply stitching the letters in alphabetical order. Reading this all made perfect sense to me. 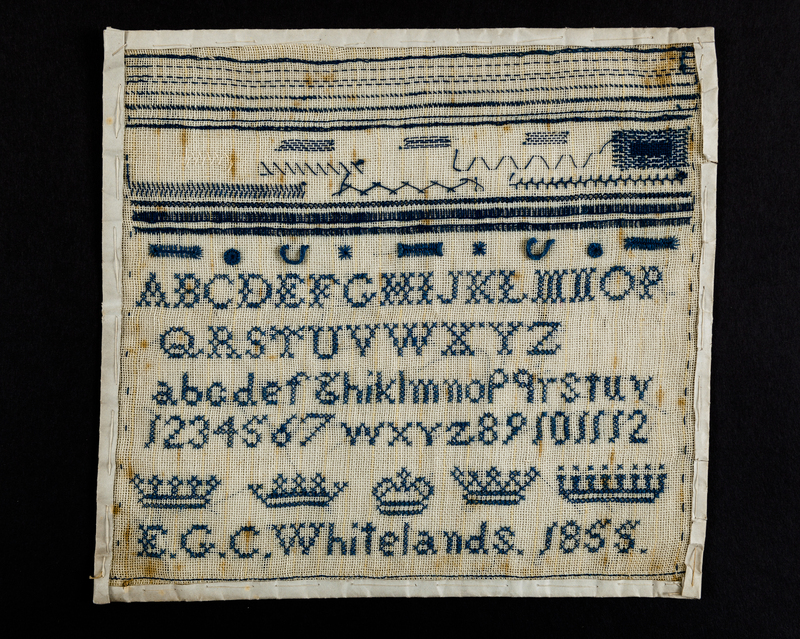 However, it’s a different matter in practice: where one was encouraged to keep the floats as short as possible at the back for the border motifs, mostly trying to keep them to short horizontal or vertical dashes, the way it describes how to stitch the letters, is very different. Suddenly we’re back to stitching from left to right, and for most of the letters, it advises you to work them in two journeys. This gives for different floats at the back: some are diagonal, and sometimes they are rather long as well. So far the “take-away” lesson seems to be: do what you think works best, and keep the floats short at the back. Perhaps unsurprisingly, there is no one method that will work perfectly every time. That said, I have seen some samplers where the back looks much neater than mine, so clearly there’s is more to learn! When I have found out more, I will share it here with you. 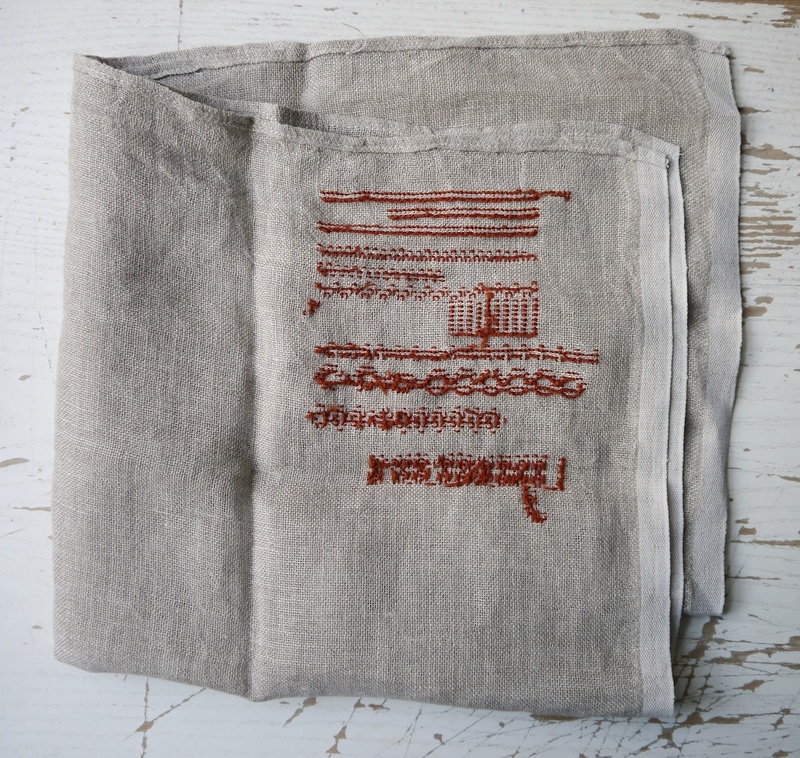 I have a lovely framed sampler of darning/patching/hemming methods. I must try and send you a photo. It was stitched by a Nora Henshaw in 1925.